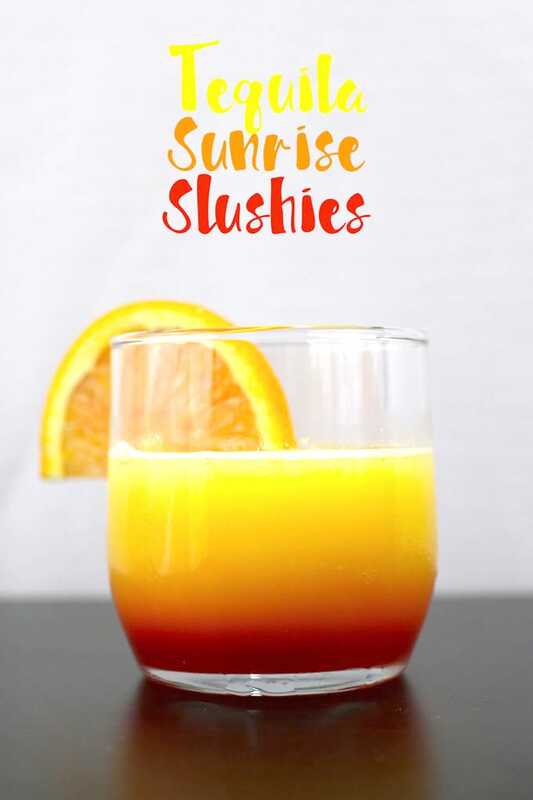 These tequila sunrise slushies are going to be your go-to summer party drink! You can easily multiply the recipe for a pitcher. Only 3 ingredients! Plus, check out the step-by-step video! Do you know what’s really easy to make? 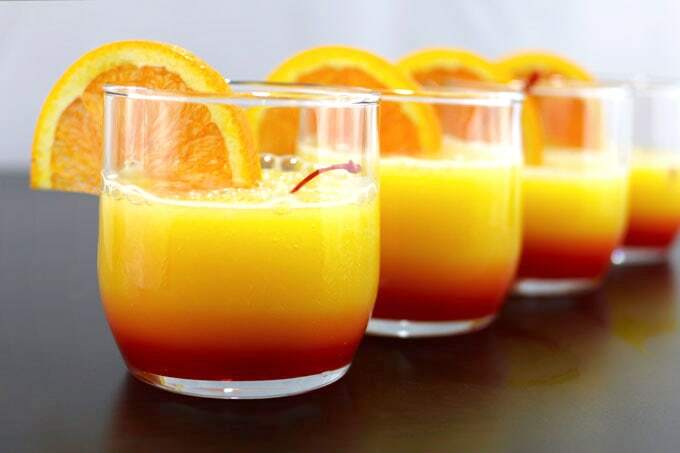 Tequila sunrise cocktails. Do you what’s just as easy to make? You guessed it – tequila sunrise slushies. 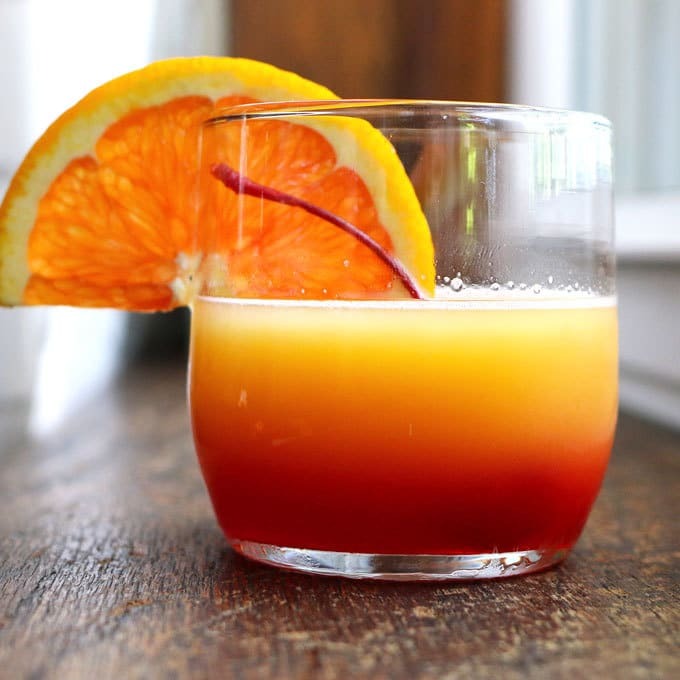 It’s super easy to make a tequila sunrise and I’ve taken this easy summer cocktail recipe up a notch. 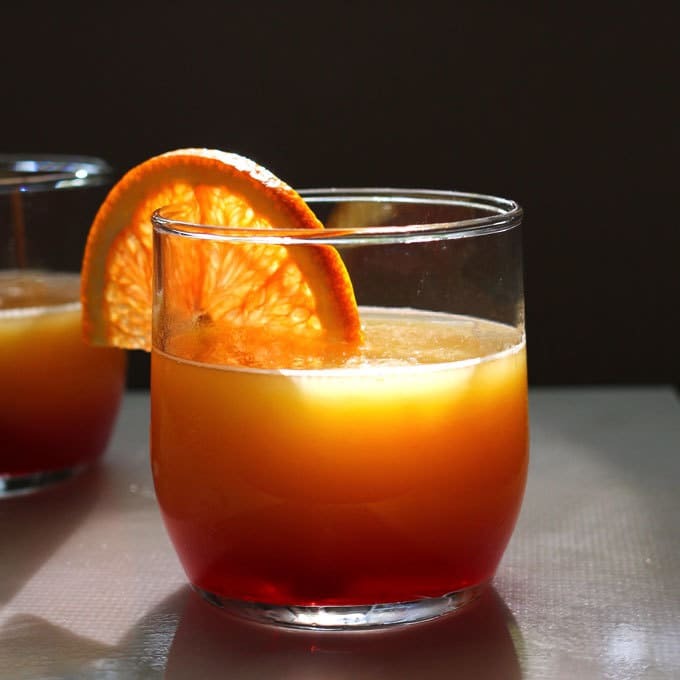 You only need three ingredients for this cocktail – orange juice, white tequila and grenadine. Fun fact – grenadine is made from pomegranate juice. I bet you thought I was going to say cherry juice, didn’t you? 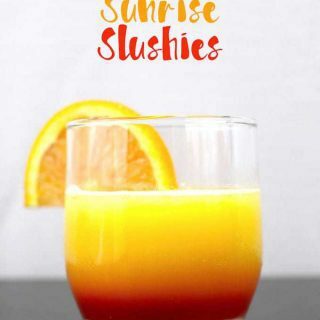 To make this fun slushie, empty an ice cube tray and pour orange juice into the open spaces. It takes a few hours for them to freeze and it’s better to wait until they get as frozen as possible. Pop those orange ice cubes in a blender with with your favorite white tequila and blend away. Pour this slush mixture into glasses and add grenadine. Grenadine is naturally a heavier liquid so it sinks to the bottom – you can pour it right in the center, or off to one side so that it sinks. This leaves you with a super fun slushie cocktail that is perfect for summer parties! Garnish with an orange slice and some cocktail cherries. The traditional drink is served over ice so you may find this version to be a little strong. If that’s the case, add a few regular (non-orange juice) ice cubes to the blender. 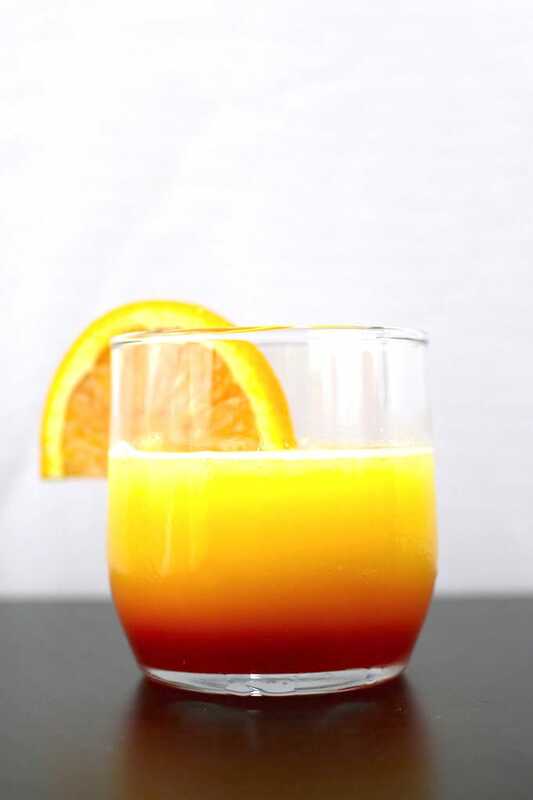 This will simulate ice cubes melting as if you were drinking a traditional tequila sunrise. You could easily double or triple this recipe and serve it in a pitcher. You could also freeze the orange juice in batches and store the ice cubes in a freezer bag for when you’re ready to throw a party. I don’t know about you, but I’m always hosting my neighbors and I’m definitely the one bringing the drinks! Freeze the orange juice in an ice cube tray. This could take as long as 3-4 hours. Once the orange juice has frozen, add the orange juice cubes to a blender with the white tequila. Pour the slushie mixture into 4 glasses. Add the grenadine to each glass. Garnish each glass with an orange slice and a cocktail cherry. Want to make your own grenadine? Check out this easy homemade grenadine syrup recipe. Want to make your own OJ? 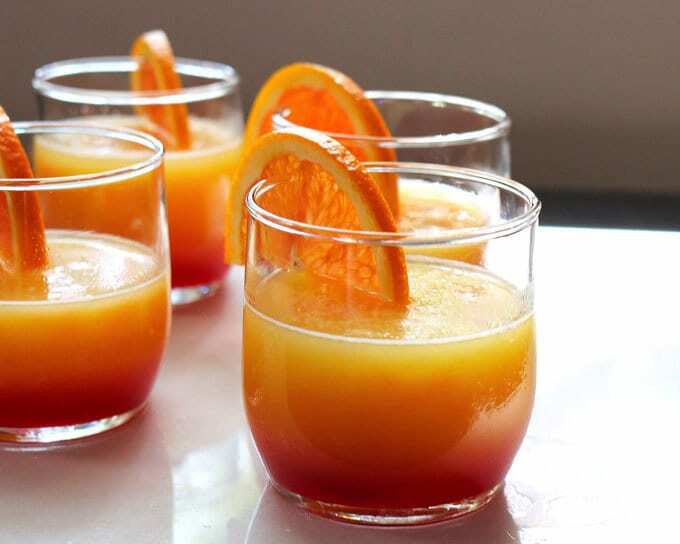 Here are 3 ways to make orange juice. That is one gorgeous cocktail. Those colors are insane, I’m totally in love! I never thought of slushifying it! Those are so pretty. How great would they look for a patio party? This is such a gorgeous cocktail and it screams summer! A beautiful, tasty, and wonderful summer drink! I saw these beautiful slushies over on Facebook and couldn’t wait to hop over to check out the recipe. They are so pretty and would be perfect to sip on by the pool. Ummm this is the perfect summer slushie! I think I need one right now. It’s 5 o’clock somewhere, right? Yep! And it’s Friday so I think day drinking is accepted everywhere ???? Hi Jenny! Thank you for sharing this. I would definitely try this on one of our weekend barbecue parties this summer! Found you through the Craftaholic blog. I couldn’t comment on your “learn how to start a food blog” post so let me say it here, thank you! That guide is really helpful for us beginners. My sister and I started our food blog last year but we kind of neglected it. Here’s hoping to be inspired more by you. TFS! Thank you for your kind note! If you ever have any blogging questions, feel free to shoot me an email! Makes me think of that song..Just another Tequila Sunrise… ok – Dating myself. Looks mighty refreshing! Thanks for sharing on the What’s for Dinner Link up! Yumm…I’ll take one (or two)! These look delish and I’m so glad you shared your awesome recipe with us at Share The Wealth Sunday! I love tequila sunrises! It always reminds me of vacationing in a tropical island somewhere. This is such a great twist on it! I always thought it was complicated to make (I think the whole liquid ombre effect made it seem so), but now that I have your recipe, I’m definitely giving this one a try. Thanks so much for sharing another awesome recipe with us on #shinebloghop, Jenny! I need one of these asap -it’s morning, but we’re on vacation so I think that’s totally allowed 🙂 These are beautiful and I bet they are so refreshing too! Looks so pretty & I bet it’s yummy! Thanks for sharing at the #InspirationSpotlight party. Pinned & Shared See you again soon. These are beautiful – I’d love to come to your house for cocktails, that’s for sure! I bet your neighbors love you! Thanks for bringing these to Throwback Thursday!